Your website isn't as useful as it intends to be. 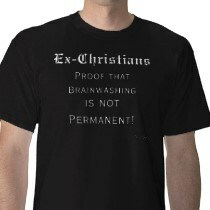 Calling it exchristian is more of a way to plant a seed of doubt into the minds of the faithful. At least the ones who are weak in their faith. I am not one of those people. And I do not have the need to see my post on public display. But do what you want with it. You see, most of the testimonies I have seen on your website immediately send up a red flag. One begins with "Catholic". Another begins with "raised in church". Another "I was saved". There are many "brands" of Christianity. But there is only ONE authentic one. And you cannot possibly follow it AND the world simultaneously. This is the number one reason why so many "fall away" from God. It is because they never found Him to begin with. Once you find the true God, you will have no desire to fall away. All of the testimonials on your website represent people who never knew God.One of your testimonials spoke in rebellious behavior against the ways of God and the church. His perception of a vengeful God is one of a self God proclaiming his own idea of right and wrong. God created all things. He can give. And He can take away. And He knows exactly why. The death of human flesh serves a purpose. That doesn't represent tragedy. Only those who worship the flesh and act like gods will regard death as a tragedy. To God it is part of nature. But the rebellious behavior of the Pagans is typical. They don't fall away from God. They fall away from a false idea of God. My point of this comment is to shine some light on something. All of the testimonials on your website represent people who never knew God. So they are in NOT ex-christians because they were never christian to begin with. In this way, your website becomes a FARCE rather than a testimonial against a religion. I have personally been in the shoes of many who have posted on here. I found God years ago much the same way as your testimonials. And I too fell away. And it was because I never found Him to begin with. I found a misconception of Him. But since then I have truly found Him. But it led me to making some major sacrifices in my life. You see, God has rules for following Him. And modern society severely breaks those rules. Therefore, you must turn away from society and start at ground level, ridding your life of many things that break the laws. If you cannot do these things, you will not know God at all. You will continue to serve yourself and He will not have that. And like in the past, He will someday avenge His own purpose once again. All the wicked who knowingly and unknowingly serve themselves will suffer a very real death. But others will learn that the life on earth is insignificant to the one they will have later on. The present life is one of pain, suffering, and self indulgence. It's ugly. It's not worth being foolish enough to ignore the truth. ExChristian.Net: Never christians to begin with!